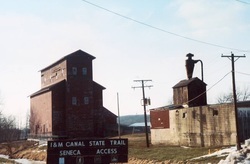 Located on the north bank of the Illinois and Michigan Canal in Seneca, Illinois, the Hogan Grain Elevator was constructed in 1861-62 by John Armour. The Elevator is located at 124 West Williams Street, Seneca Illinois 61360. The Grain Elevator is owned and operated by the Illinois Department of Natural Resources. It is open for tours during special events by appointment only. Please see our Events page for special event tours or contact the IDNR at (815)942-0796 to schedule a tour.